San Francisco, one of the most beautiful cities in the world, is a perfect family getaway thanks to its compact visitor areas and exciting sights. Famous San Francisco destinations such as Alcatraz Island, Fisherman’s Wharf, Chinatown, Ghirardelli Square and the Golden Gate Bridge are all easily accessible from Nob Hill to Telegraph Hill. 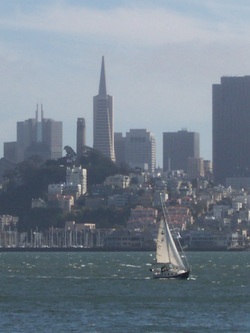 As a result, a visit to the “City by the Bay” can be paced to suit your family’s particular moods and interests. In San Francisco, you can see all of the major tourist areas, or just one of them, and still enjoy the best of the city. When traveling with young children, one way to put yourself in the best possible position to see San Francisco is to choose accommodations central to the City’s highlights. Accommodations on Fisherman’s Wharf or Nob Hill will make it convenient for you to get around the main areas of interest. If you start your tour in Chinatown, you can walk downhill or ride the famous cable cars to Fisherman’s Wharf. Simply focusing on these two areas of the city can provide a full adventure for the whole family. Sunday mornings are a good time to explore Chinatown if you are traveling with young children. During this time, the shopkeepers are busy setting up their stalls, markets are full of delectable foods, and the locals are out for their morning walks. At this quieter time of morning you can watch the city within a city awaken and come to life. Chinatown is home to the largest Chinese settlement outside of Asia and is renowned for its distinctive vibrancy and character. The exotic ambiance encourages exploration. Peek into the vendor’s shop windows, examine the ornate dragons on the street lamps, and stop for dim sum at one of the many restaurants. You will find no shortage of food stuffs to sample and delicacies to taste. Fisherman’s Wharf is a major tourist destination for families and is filled with things to entertain the children. All you have to do is start at one end of the waterfront and work your way to the other end, stopping to see and do as it strikes your interest. Fisherman’s Wharf is a cornucopia of sights, sounds, smells and activity. Stroll along the waterfront looking at the myriad colors and types of boats, watch the amusing street performers, and sample the delicious foods synonymous with the city like seafood and sourdough bread. Buy a shrimp cocktail to go from one of the many outdoor vendors and continue following the Embarcadero to Pier 39. Pier 39, one of the most-visited attractions in the nation, is sure to delight all ages, and quickly become a favorite spot for your family. Due to its wide variety of activities like rides for the little ones, the video arcades for the older ones, and more than 100 unique shops for the adults, Pier 39 is a treat. From this vantage point you can get a real feel for the area since all major landmarks are within view: Golden Gate Bridge, Bay Bridge, Angel Island, Coit Tower, the TransAmerica Pyramid, the world-famous skyline, and the infamous Alcatraz. Located less than two miles from Fisherman’s Wharf, Alcatraz Island is a must-see for history buffs. You can board a ferry to the infamous island from a nearby Pier. The ominous former prison known as “The Rock” is an amazing attraction for adults and older children. Once on the island you can take a self-guided walk, hear a presentation, or join a walking tour. If you go to San Francisco, plan to spend at least a full day exploring the wharf area. If you have small children, you may want to split your Fisherman’s Wharf exploration time into two shorter trips. 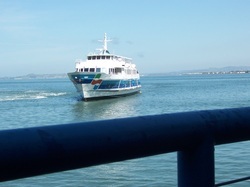 If you plan to see Alcatraz, make reservations for the ferry in advance and wear good walking shoes. The terrain on the island is steep and rocky. During the summer months expect mixed weather and large crowds; in the off-season expect cool and rainy weather, and fewer tourists; in any season be sure to bring a sweater or jacket and comfortable walking shoes. Undoubtedly, year in and year out, young and old alike will delight in discovering the many joys of this popular City by the Bay. Bring a detailed map of San Francisco with you to help plan your routes (Google Maps is an excellent tool). Choose accommodations close to the action so that you can easily walk there and back. Plan to leave your car in a parking lot and see the sights up close. Don’t count on always being able to use a stroller for the littlest ones (since some streets are too steep and the wharf area may be too bumpy).